I say that it thinks that there is a gas build up in the cell but it could also be that there is a connection problem with the cell, or a calcium build up in the cell. Lets look at how this works. In a typical installation, the water is drawn from the pool by the pump. It flows through the filter and then through the heater and finally through the venturi assembly where the Watermaid cell is mounted. The water is then returned to the pool filtered, heated and chlorinated. The picture above does not have a heater for simplicity. The water flows into the cell from a T assembly which forms a venturi. The water flows into the side of the cell mounting T and down past a venturi nozzle. this water flow past the nozzle draws water up into the cell where it is chlorinated. This gives us an inner tube which extends from below the side inlet of the 40 mm T-Piece to the top of the cell. The inner cathode has a domed cap which seals the upper end of the cell. This domed cap is attached to the cell cathode by two metal strips which secure the cathode in place and power this electrode. Water flows into the 40mm T-Piece and down past the venturi nozzle. this creates a vacuum which pulls water up the cell on the outside of the cathode. At the top of the cell, it rolls into the centre of the cathode down past the locating spacer and out the centre of the Venturi Nozzle (circled in Red above). Now that we have water flowing up the cell between the otside of the Cathode and the inside of the Anode and cell housing, we simply have to power the two electrodes (Cathode and Anode) and we can generated chlorine from the salt water passing between the two. One of the concerns that we have is with a gas build up in the cell. If the water flow is restricted or there is a problem with the pump when the cell is powered, we can generate a hydrogen/Oxygen mixture which can be dangerous. Watermaid has put a safety in place to identify this gas build up. A gas sensing tang which is simply a small piece of bent up metal is placed at the top of the cell. If you remove the cathode, you can see it on the inside of the Anode near the top. When this small piece of metal is covered with water, it can sense the current flow through the water. It is sort of like licking a 9 volt battery to see if it is dead. If the water flow isn’t sufficient, it will build a gas bubble at the top of the cell and eventually it will force the water down past the gas sensing tang. When the gas sensing tang is no longer covered with water, it can no longer sense the current flow and the processor in the power supply shuts down the power to the cell and turns on a Red Flashing Light to alert the home owner of the problem. If you have a red flashing light, here is how to identify the cause. 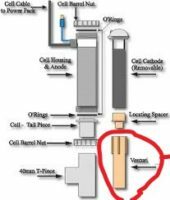 1/ Did you clean the cell and forget to replace the venturi in the T-Piece. Sometimes the venturi sticks to the bottom of the cathode when the cell is removed or dis-assembled. A lot of times people pull this piece off and set it on the heater or a shelf in the pool shed and forget to put it back in when they put everything back together. It is a small tube about 6 inches long . It has to be in the T=Piece or the water wont get to the top of the cell. Find the venturi piece and reinstall it. This will cause a red flashing light if not installed. 3/ Is your filter plugged. We see this mostly in the spring when people vacuum their pool and don’t set the filter to waste. It plugs the filter restricting water flow causing this problem. Do a really good backwash on your filter to clear this debris. This should clear the red flashing light. 2/ Is the gas sensing tang (the little bent up piece of metal in the cell) covered with deposits. simply scrape this part clean. 3/Follow the grey cell wire to the bottom of the power supply which is the box that hangs on the wall. The grey wire goes under a black plastic cap which covers three brass terminals. Remove the single screw in the cap and remove it. We are only interested in the centre (white) wire for this fault but this is a good time to check all of the connections. In this diagram you can see the cell cable and the centre white wire that goes all the way to the gas sensing tang in the cell. Make sure that there isn’t any corrosion in this area and that the brass screws are tight the screws are pressing down on the metal at the end of the wire not the insulation. Use a common (flat) screwdriver to tighten the screws. They are brass and strip easily. If you find corrosion,(like an old battery terminal) clean it off. This is the cause of your Red Flashing Light. You can shorten the cell wire if needed. If you need to shorten the wire, you can crimp a terminal on the stripped wires or simply tin the wire with a bit of solder to make the connection better.